I loathe cleaning the microwave. It’s a necessary evil because I can’t stand to see stuck on food in there. John likes to cook his eggs in the microwave when he is making egg sandwiches. It leaves such a mess! 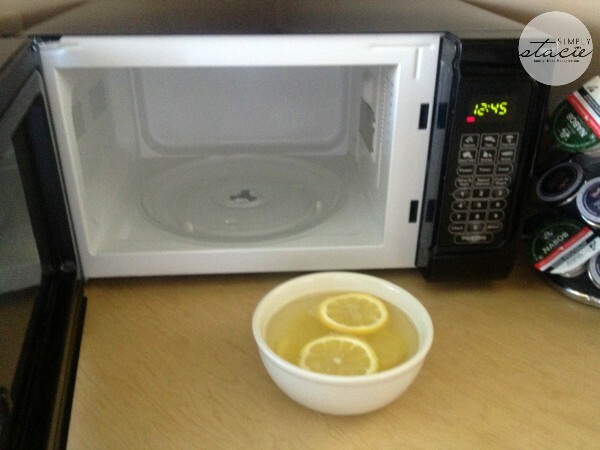 Today, I want to share a simple cleaning hack to get your microwave clean and fresh. The best part is that there is NO scrubbing or harsh chemicals required! 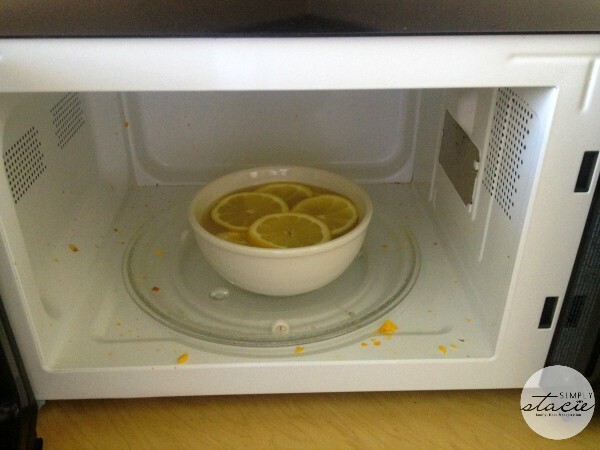 All you need to get rid of all that caked on food from the interior of your microwave is some lemon slices, a splash of vinegar and some water. 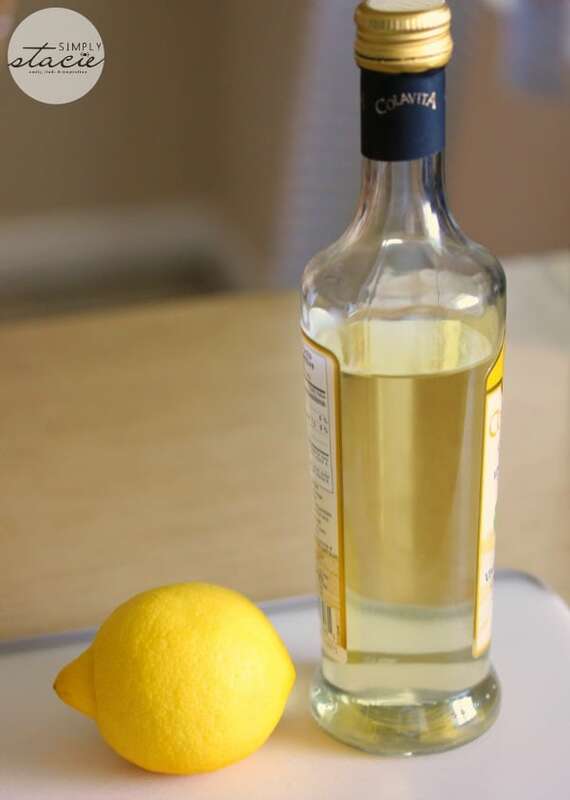 I normally use regular white vinegar, but ran out so I improvised with white wine vinegar. It worked fine. 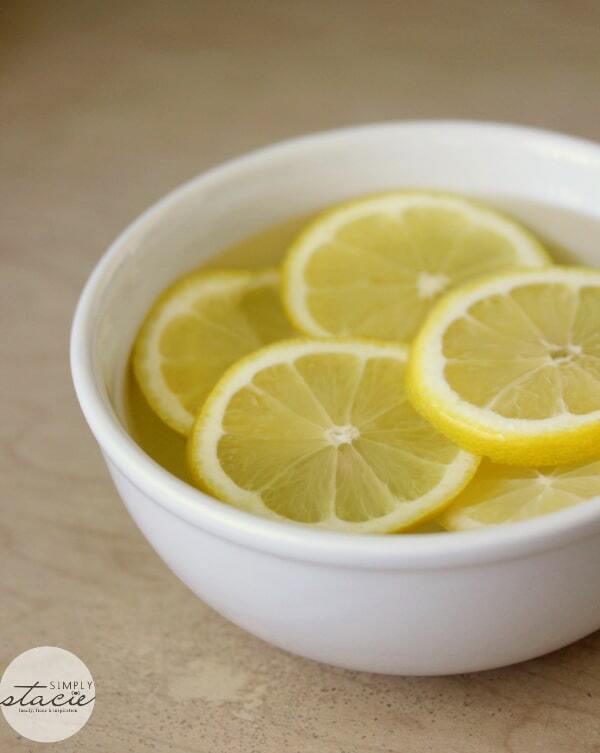 Take your lemon slices and put them in a microwave safe bowl filled with water. Add a splash of vinegar. Place the bowl in the microwave and cook on high for five minutes. I hate this picture below, but wanted to give you a before and after look. Leave the bowl sit in the microwave for a few minutes after the five minutes are up. Then carefully remove the bowl and using a damp cloth, wipe the inside of the microwave. 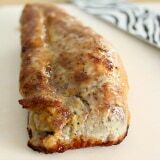 The previously stuck-on food should just slough off with little effort. It’s now clean and fresh-smelling and done in under 10 minutes with very little effort on my part. How do you clean your microwave? 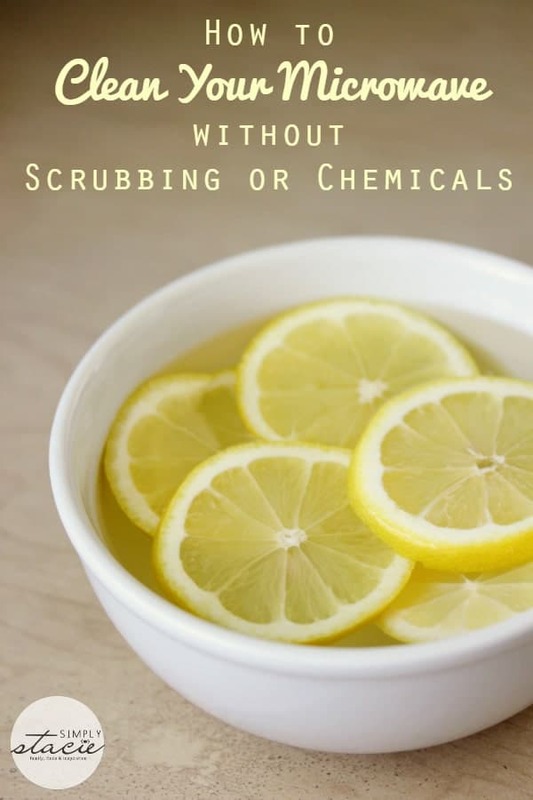 This is a great tip, it’s always great to learn new ways to clean without using harsh chemicals. Thank you for sharing this post. Great Tip!! Very Good to know. Thank you, thank you, thank you for this great tip. OMG I hate hate cleaning my microwave. Mine is so filthy right now. I was just thinking this morning that I have to tackle the microwave. I hate scrubbing that thing. Great tip and I try it tomorrow. This is Great! I hate cleaning my microwave with chemicals knowing that I am going to put food in there for my family. I can’t wait to try this. Thanks! Thanks this is a great Tip! I am loving this idea!!! I hate when I open my microwave and it looks or smells funny,like maybe popcorn for instance.This will help me clean it and it will probably help it to smell so much better too.Thank you. nice! this could make one clean up job easier! thanks! going to try this method with the lemons. Refreshing smell. I hate when someone burns popcorn in a microwave that the most horrible smell to get rid of. I work at a hotel. I wonder if I could pull that off in my rooms. Can run the microwave while I’m cleaning the rest of the room. Carry the bowl from room to room. I’ll have to try it at home and see if I can pull it off. May I suggest a microwave cover for your husband eggs etc. 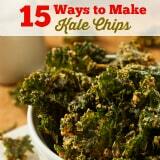 It actually helps cook foods faster as well as keep clean. http://mobile.walmart.com/ip/Nordicware-Microwave-10-Spatter-Cover/14035716. Love the idea of getting rid of smells. Thanks for the tip. 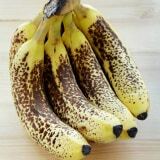 I also recommend a cover, but not anything plastic that can leach toxins into your food. (BPA isn’t the only thing to be concerned about re. plastics.) It’s glass all the way! Pingback: Greatest Cleaning Tricks Ever! wow, this is great. Thanks, I can’t wait to try it. Double duty: pour the liquid, two lemon slices and some ice cubes down your sink garbage disposal and run for 5-10 seconds. Cleans the disposal and leaves a fresh lemony smell! If I don’t have any lemons, could I use either a lime or perhaps lemon juice?! 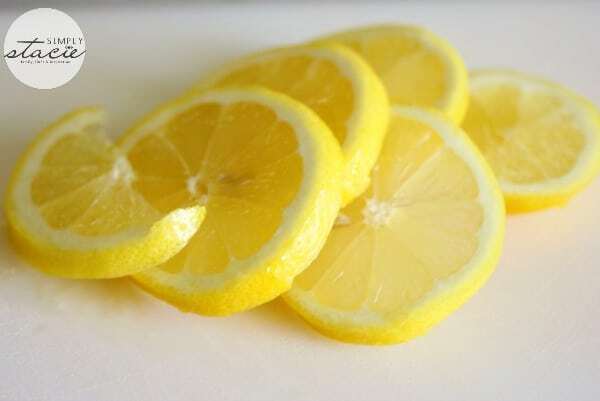 Use 2 tablespoons of lemon juice instead of the lemon itself. Thank you for the article! I love learning cleaning tips with natural ingredients!